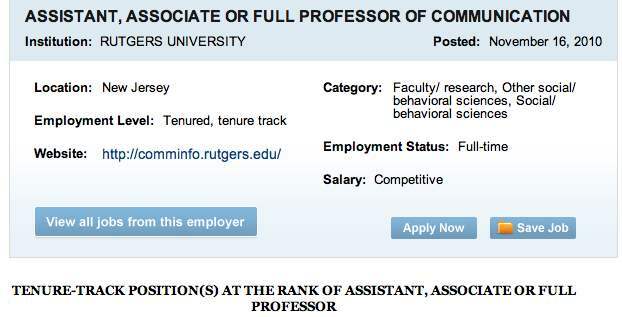 The Chronicle of Higher Education is a good source for faculty job positions. This is a portion of a job posting. In class next week, we’ll continue our discussion of that process with the help of two former students in the course both of whom have been on the job market this fall. One recently was hired for an assistant professor position that will start next fall, and the other just returned from a campus interview. The two will be sharing their experiences of preparing their application materials and then going through the campus interview process. Let me highlight a few of his recommendations and add a few hints of my own. Be able to explain why you want this particular position – As Dean Dad noted, the faculty don’t want to hear that you are drawn to the geographic location of the school or some other non-school factor, they want to hear that you know the college, its programs and its faculty and want to be a part of that team. As Dean Dad says, you want to come across as solving the college’s problem of having the right hire and not just solving your own problem of needing a job — or wanting a job near the ocean or your aged parents. I remember a candidate for an administrative position in the college gave three reasons when asked in a faculty presentation why he wanted that administrative position. The quality of the university’s athletic program. Good public schools for his children. The quality of our college and faculty. Better to have told us just that third reason. He was not the candidate who received the job offer. So you need to do your homework about the college, its offerings and its faculty. The Internet has really helped with that research and preparation process. You can read course descriptions and faculty bios. You can learn about student organizations and college activities and be ready to address those in your conversations with faculty. Be ready to ask questions yourself – Most of our candidates are on campus for two to three days. They make two formal presentations (a teaching presentation and a research presentation) and meet individually or in small groups with almost everyone in the department. They meet with the college administrators. They go to meals with faculty members. So, as Dean Dad says, you may be asked what questions you have. I think a really good question is: “What do you like about being on faculty here?” That question can help you both learn about what faculty members consider to be the strengths of the college/department and also helps you get to know the faculty members. And if you ask that question during a lunch or dinner meeting, the faculty member will be talking, and you actually will have time to eat. Be ready for your formal presentations – When you are contacted about making a campus visit, you want to determine what presentations you will be expected to make. As the University of Florida is a research institution, candidates for faculty positions in our college are expected to make a research presentation. This is where applying for a community college faculty position is different from applying for a university faculty position. Dean Dad advises candidates for a community college positionnot to talk about research, as the focus of the community college position is teaching and service. At UF, research is a top priority for almost every faculty position. So a successful candiate will need to demonstrate that he/she already has started a research track and has plans for how that would continue. Candidates for faculty positions in our college also make a teaching presentation. You want to contact the faculty member for the course you will teach in. Find out what has been covered in the course prior to your presentation, the number of students in the class, and, most importantly, what the topic is for your presentation. In some cases, you may be asked to teach the topic that the faculty member had in the syllabus for the particular day of your visit. In other instances, you may be asked to select your own topic. Most often, you will be expected to make one or both of these presentations using slides, so make sure you have your PowerPoint or Keynote in several locations (i.e., flash drive and e-mailed to yourself), and be sure that you have talked to the chair of the search committee about making any technology arrangements for you. You’re “on” all the time – From the time you are picked up at the airport until you depart, you are being evaluated. A candidate who may make an excellent research presentation may come across as not collegial (i.e., too self-important) in a lunch meeting with faculty. A candidate for an associate or full professor position can snub the assistant professors or adjuncts who are involved in the interview process. A candidate can have too much to drink at dinner and makes some unfortunate comments. When you pack for the campus visit … Take a few extra copies of your vitae. Sometimes you will be meeting with faculty members who weren’t on the search committee and may not have seen your vitae. You may be one of several candidates interviewing on campus within a few days, and the faculty may need the viate to be reminded of who you are. If you have a copy of your teaching portfolio, take that with you. You can decide when and with whom to share that. You may only show it to one or two faculty members, but it can make a strong impression about your commitment to and interst in teaching. Consider what you are going to wear. You want to be professional and comfortable in what you wear. You don’t want to be limping by the end of the second day because you are wearing new dress shoes. If you are interviewing at a sports-minded campus, don’t wear the rival school’s colors. I advise grad students who are going for a campus visit to pack a few energy bars. Sometimes the schedule is so hectic that there’s not time for a meal, or at the meal you are so busy answering questions that you don’t have time to eat. Be professional, pleasant and positive – You may have accepted the invitation for the campus visit because you wanted the practice before going to the interview you really want. Or it may be that within the first hours of your campus visit you realize that this isn’t the job for you. Pursue every campus visit with professionalism and a positive outlook. A position you don’t think you’re interested in may look better if it is your only offer. And the world of higher ed, especially within a subject field, can be smaller than you might think. If you come across as disinterested or under-prepared in a visit to one campus, the faculty at that campus may talk to the faculty at the institution where you really want the job.